Nagano, the roof of Japan, has many waterfalls. Tadachi Falls (田立の滝) is one of 100 best Japanese waterfalls located in Nagiso, Nagano Prefecture. There are many waterfalls along Otaki River. 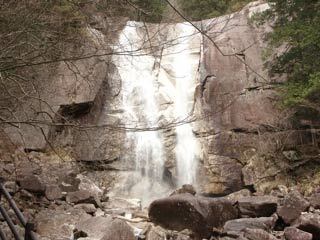 The name Tadachi Falls is the collective term of those waterfalls. It is designated as the scenic beauty of Nagano. It is a popular hiking course to enjoy many waterfalls and great view from the top of Fudo Rock. There is parking and restroom at parking. Hiking takes 3 hours. Requires nice shoes for hiking.